Iraq's justice minister said Tuesday that Saddam Hussein's trial on war crimes charges will be over by the end of the year and accused the United States of trying to delay interrogations of Saddam. Abdel Hussein Shandal's comments underlined the Iraqi government's determination to bring the ousted leader to trial swiftly. They also reflected behind-the-scenes tension between Iraq and the U.S., as American officials worry about the prospect of Iraq rushing into a trial unprepared. "It seems there are lots of secrets they want to hide," Shandal told The Associated Press in an exclusive interview. There was no immediate comment from U.S. officials, but they have said publicly in the past that Iraq gets to make the decisions about Saddam's trial. Shandal, in Brussels along with other Iraqi leaders for an international conference on Iraq, said no date has been set for Saddam's trial, but was confident it would conclude by the end of 2005. "This trial will be accomplished within 2005 — and this will only be in Iraqi courts," he said. U.S. officials, however, privately have urged caution about rushing into a trial, saying the Iraqis need to develop a good judicial system — one of the main topics of discussion at the EU-U.S.-hosted conference on Iraq Wednesday. They also worry a trial could interfere with the key process of writing a constitution. The Iraqi government must finish a draft by mid-August so they can hold a referendum on the charter ahead of December elections for a full-term government. U.S. officials also say putting Saddam, a Sunni, on trial could inflame sectarian tensions in already-turbulent Iraq. There was no immediate comment from the Iraqi Special Tribunal, which is to put Saddam on trial. Officials referred to a past announcement on the issue, saying there was no timetable for the trial. The tribunal in the past has criticized government officials, including Prime Minister Ibrahim al-Jaafari's spokesman, Laith Kuba, for suggesting that a timetable had been set. Kuba said in early June that Saddam's trial would start in two months. The tribunal also has sought to stress its independence from the government. "Any date to start the trials belongs to the judges," the tribunal said in a June 6 statement. Saddam, who is being held in a U.S.-run detention facility near the Baghdad airport, was captured in December 2003. He and 11 of his top lieutenants will be tried by the IST, which was set up in late 2003 after Saddam was toppled. "Now we are in the process of interrogation. The process requires collecting evidence, but the rule of Saddam was for 35 years and we need a lot of evidence, a lot of interrogations," Shandal said. Saddam, 68, faces charges that include killing rival politicians over 30 years, gassing Kurds in the northern town of Halabja in 1988, invading Kuwait in 1990, and suppressing Kurdish and Shiite uprisings in 1991. 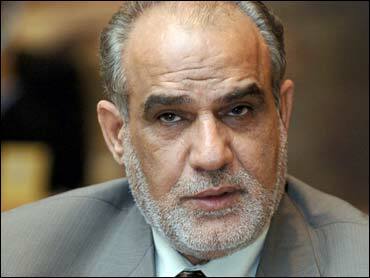 Shandal said he also would face charges related to the destruction of Iraq's infrastructure.